What do you get when you cross an urgent care system under tremendous pressure with a newly formed Patient Safety Collaborative looking for a flagship project? asks Managing Director Deborah Evans ahead of our session at Patient First on 22 November. Against all expectations, we found that our proposition to embed the National Early Warning Score (NEWS) across the entire urgent care system in the West of England has captured the imagination of clinicians in primary care, acute hospitals, mental health, community services and the ambulance service. Our clinical director Anne Pullyblank showed a short film at one of our conferences and a few months later 130 people turned up at an engagement event. The very next day, we started getting phone calls from clinical teams saying they were starting to use NEWS in areas that had never used it before. We have been living with the consequences ever since. How do you get a good baseline when blessed with clinicians who Just Do It? How do you set a measurement strategy for whole system change? How do you attribute causes when so much is being changed right across the urgent care system all the time? Our NEWS journey will be the subject of our session in the Best Practice Theatre at Patient First later this month, “The deteriorating patient – what about Bobby?” which will highlight the huge potential NEWS has when used across the entire system at every handover of care. We’re now 18 months into this journey and have been reflecting a great deal about the role that Patient Safety Collaboratives can play. We are one of 15 Academic Health Science Networks, comprising the AHSN Network which covers the whole geography of England. Each AHSN coordinates the Patient Safety Collaborative covering the same patch. The AHSN model of a network of member organisations gives us a strong basis for engagement and grassroots support. We thrive where clinicians and their organisations commit their discretionary effort. We have a system wide perspective because we include CCGs, NHS trusts and other providers of health care, and can draw in statutory and non-statutory partners. We are independent and are seen as such; we are not part of the performance management system experienced by so many. We work in partnership with Sign Up to Safety, the Health Foundation, NHS Improvement and many, many others. In a landscape of overlaps and gaps we are giving many clinicians an opportunity to work together, rather than in competition. Patient Safety Collaboratives are now in their third year of operation and all over the country there are heartening, ambitious and innovative projects in play. We share and learn together and have developed a ‘logic model’ to provide a conceptual framework. We build capability with our member organisations and have developed a software platform ( Seedata Life system) which is already the repository for hundreds of quality improvement (QI) projects – offering all the tools to run QI work and share the learning. Already we have some ambitious and large scale programmes. The Emergency Laparotomy Collaborative is a shared project across 25 acute hospitals in the West of England, Kent, Surrey and Sussex, and Wessex – we are improving the quality of care together and using a shared national set of metrics to review and learn. The South of England Mental Health Collaborative embraces 16 mental health trusts and offers inspiring learning sets on an ‘all share, all learn’ basis. This is parity for mental health services beginning to move from words to commitment. We will have a strong presence at this year’s Patient First. Visit our Patient Safety stand to find out more about us and our work. Talk to people from your area. Make connections. Attend our Best Practice Theatre. Feel the energy. The West of England AHSN’s performance of “The deteriorating patient – what about Bobby?” will take place on Tuesday 22 November at 14:30 in the Best Practice Theatre at Patient First. 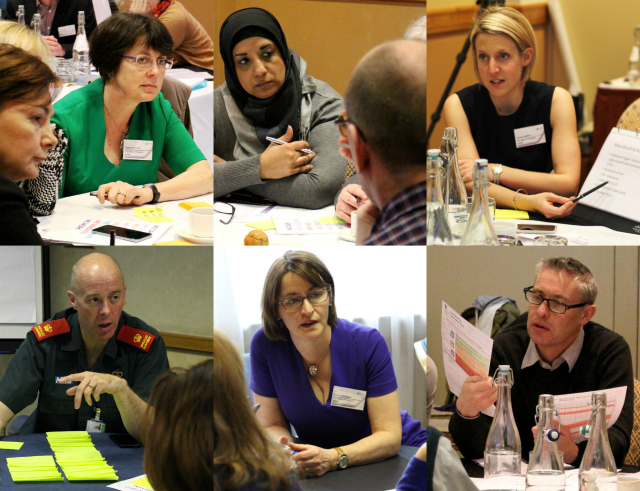 Download the full programme here and register for a fully-subsidised place at www.patientfirstuk.com using the code AHSN46.